Most people who want to try out wakeboarding will have had some experience with water sport in general. They know the speed and adrenaline of speeding across the water while holding on to the back of a speed boat. Although, there might be a rare person who doesn’t have any experience, but after seeing a wakeboarder, it awakens their curiosity. 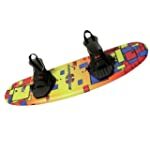 The wakeboarder is strapped to the board with bindings much like a skier on a mountain places their feet into bindings. They hold onto a rope and are pulled behind the speedboat. They do spins, turns and flips using the wake behind the boat as a water ramp. The sport has been around since the 1980s, but officially became an event when sports organizers started staging televised events on ESPN. What Influences Your Choice of Wakeboard? When purchasing a wakeboard, consider your skill level. As a beginner, that might be close to zero on a scale of 1 to 10. 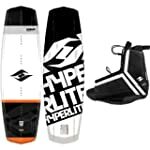 While you’re able to use any type of wakeboard as a beginner or intermediate rider, some boards are more suited to the beginner than others. 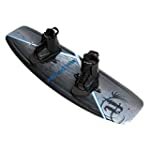 There are beginner’s wakeboards that are usually long with square rails. Long boards skim through the water requiring less energy from the rider. They’re easier to control as well. If you want to be able to do tricks, picking up a short board might be a better choice. 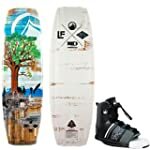 There are also board tips to worry about when purchasing your first wakeboard. If you are familiar with other board sports, you’ll know that there are single- and twin-tip boards. Ones with a single tip have a front that is tapered but a back that is square. This doesn’t allow for flips or turns where the rider can skim the water backwards. While beginner’s boards are normally cheaper than those for advanced riders, you might want to consider a short board with twin tips if you plan on learning to perform tricks. On the other hand, if you don’t have any knowledge of boards at all, stick with a beginner board while you’re learning to stay on top of the water. Once you’ve decided on the tips and length of board, you’re not done making decisions. The length isn’t focused on short or long alone. There are degrees of length to consider. You’ll need to decide on the board’s rocker, the materials and fins as well as other factors. The length of the board is influenced by the weight of the rider and their riding style. A rider who weighs under 150 pounds will need to choose a short length under 134 cm. Each board manufacturer will have a size chart that should help with the buying process based on weight of the rider. The board’s rocker is the shape of the bottom of the wakeboard. It impacts the way the board moves through the waves. It also influences how the board pops out of the water during the ride. There are continuous rockers, three-stage rockers and hybrid rockers. Continuous rockers have a smooth, continuous curve with no edge, which can give the rider a faster ride, but the rider isn’t raised very far out of the water. Three-stage rockers have two breaks, which create 3 planes and greater control of the board. With the flow of water being separated, the rockers actually slow the board. A hybrid rocker is a mixture of the two. It’s a smoother ride with a good pop. Any water board needs to be light yet sturdy. 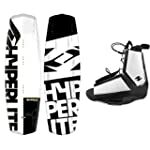 Wakeboards come in two types of materials. One is the foam board, which is used in rough water conditions. They’re more flexible and allow the rider to stabilize on the board. The honeycomb board is lighter and faster, but harder to control during bumpy conditions. 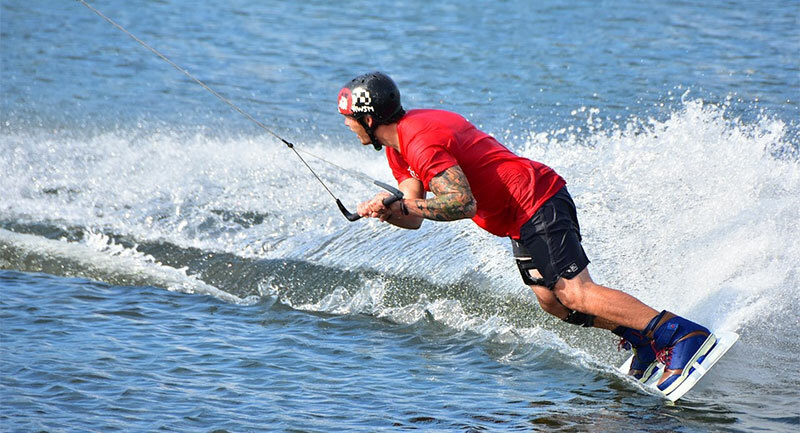 While water skiing ropes are stretchable pieces of rope, those for wakeboarding offer no stretch. This enables the rider to achieve the biggest pop possible. The ropes are usually 55 to 80 inches. For beginners, riders will want to choose poly E ropes that provide a little stretch and are relatively inexpensive. A wakeboard can be purchased with or without fins. The fin will keep the board traveling in one direction, which makes them a good choice for beginners. The board won’t spin out of control when it has a fin. Some experienced riders will use fins in choppy water too. The bindings are what secure the rider to the board. The rider wants to find a comfortable boot that isn’t too snug. It should be flexible for those who want to do trick, or stiff for those who want more stability. There are also closed- and open-toe bindings. 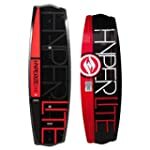 A sports store will have knowledgeable staff, but they might not have all the wakeboards new riders will want to see in person. You can head to a store to try out the variety of different models to get a feel for them in person. After that, you can head online to do more research and make your decision. 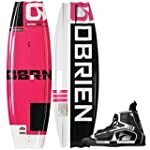 When you research and buy online, beginners are able to find the right board with the materials they’ve decided to use in their wakeboard. Purchasing online offers more selection, but the inability to test the models in person. 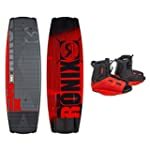 Finding and buying the right wakeboard for a beginner starts with gaining knowledge about the right kinds of materials, rockers and bindings. Once you’ve decided on these as a beginner, you’re ready to make a purchase and hit the water.